Our downtown nightlife directory is ready to show you a good time. When was the last time you had a really good night out? Downtown makes it easy – almost too easy – for you to fill your nights with fun. We like a good excuse to party. We’re the epicenter of Dayton’s booming craft beer scene, with a huge concentration of independent brew pubs and a ton of bars that love to vie for the bragging rights of best selection of craft draughts. Spirits are big business here, too, as we’re home to the #1 seller of Irish whiskey in Ohio, one of the top bourbon bars in the nation, and some great bartenders who know how to make a cocktail. 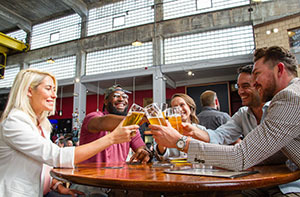 You can also find plenty of quiet places to sip wine, amazing outdoor patios, dance clubs, a great LGBT scene, fantastic music venues, old local taverns, trendy lounges, grown-up arcades, and other stops to include on your next bar hop. We’ll see you out on the town.